She is not a simple person, although her way of living is careful and orderly. She is utterly brilliant, but her way of being in the world is respectful, inquisitive, and admiring. Louise has a potter's gesture that reveals itself when she is making tea or making up the guest room. She knows just about all there is to know about Asian ceramics but is always on the prowl for new ideas and other ways of looking at things. 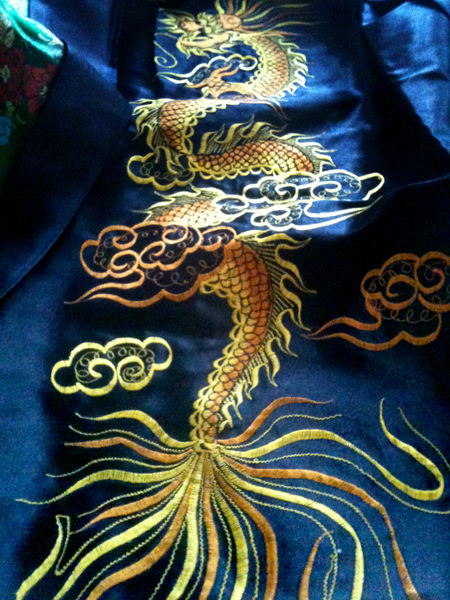 For her birthday, for the new year, and to mark our long and important friendship, Louise sent me a beautiful Vietnamese robe. She and I will wear these dragons on our spines, together, simultaneously, and forever. Hello, Eugenie. It's Michael from Cleveland and I am reading your blog entries to Olga. It's about 10 at night and I'm still at work and thought this might be an interesting topic for tonight's conversation. Yesterday, we went to the Art Museum for MLK Day and Olga and I discussed modern art, although she did not like most of it--particularly Oldenberg's big tube of tooth paste. "Yuck!" Olga is now going to say a few words: "I wish you were here. I love you." Nothing else at the moment, but we have had a good conversation on how it is possible for me to read your thoughts on the computer, not to mention the responses of your friends, a concept that seems terribly public to Olga. Olga remembers your friend Louise Cort and mentioned some nice memories as I read this particular entry. I hope you are recovering well. I get updates periodically --Eugenie is driving now!-- and look forward to seeing you when you can make the big trip to Cleveland.